Finding the name of the syndicate that developed the land proved to be the clue that enabled us to crack the method used to name these streets. George Cork was a local administrator with an entrepreneurial flair. He managed the local theatre, as well as working in lawyers’ offices. 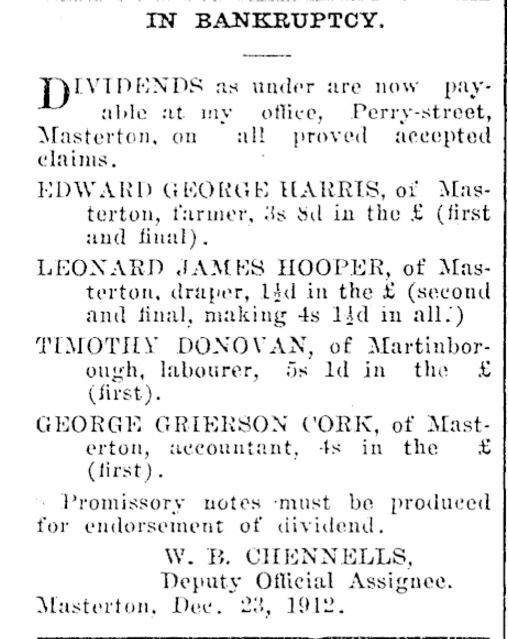 Later, having left Masterton, he became an accountant. Examination of the electoral roll showed that his middle name was Grierson. Examination of the births register confirmed that just before the streets were constructed his wife had given birth to a daughter duly named Edith Grierson Cork. Hence Edith and Grierson Streets, the first named after his daughter, the second after his own middle name. Unfortunately, Cork suffered a bankruptcy in 1912.